One of the most expensive purchases people make is their vehicles. Auto Shine Car Wash & Detail Center just opened at 660 Roosevelt Trail in Windham, to help keep cars clean, maintained and ready to take on Maine’s weather. With the salt and calcium on the roads, cars take quite a beating. “The more you come in the better for your car,” said district manager Josh Chase. With three self service bays, one touchless bay and one SpinLite tunnel, Auto Shine has the capabilities to clean sedans, SUVs, trucks, boats, RVs, campers and motorcycles. “We want to build relationships and make customers feel like they want to come to a car wash, not that they have to,” said Josh. It took almost a year to get everything in place to open the location. John Chase, owner of Chase Custom Homes & Finance and Auto Shine Car Wash, attended the August opening day. “Come out, you’ll see. We’re looking forward to a great winter season.” Chase opened his first business in Windham and stayed in town for 18 years. “It’s time to get back into Windham,” he said. “There’s two times as much stuff below ground,” said Josh. The car wash is high tech using cell phones or computers to control the equipment to wash the cars. 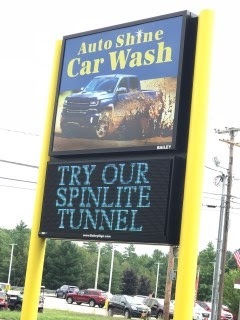 The SpinLite tunnel has a clean, modern look with advanced technology that uses sonar to program the wash to each type of automobile. In the tunnel, it’s a cross between a casino and a disco. Spinning lights and a gentle wash experience make this the car wash to enjoy with the kids or by oneself. The driver provides his or her own music. The touchless wash has no tracks. This is perfect for cars with a low clearance. There are 12 different sonars measuring the shape of the cars. “It took one month to program everything. There’s so much to a car wash,” said Josh. All of the concrete is heated making it safe to wash the cars in the dead of winter. “We’re all about quality. We make sure every customer is satisfied. We strive for quality,” Josh said. Prices vary depending on the type of wash or the detail package a customer chooses. The tunnel prices vary from $13 for a basic wash to $25 for a full cleaning including the under carriage and the wheels. The touchless bay goes up to $18 per wash. All choices are explained to each customer when they pull up. The self-service bays have a 12- by 12-foot opening and are 40-feet long, suitable for boats or RVs. There are also hand dryers in the self-serve bays. Customers buy time at $4 for 5 ½ minutes. Auto Shine also provides quality detailing for all vehicles. The detailing packages can go from a 30-minute express service to more detailed cleanings by appointment. There are ten to twelve options priced for every budget. Josh does consultations to explain what each package covers. RVs and boats are charged by hull length or square footage. They also perform paint corrections, restore headlights, shampoo seats and clean and condition leather. Auto Shine uses Simonize chemicals. The Simonize company provides training for the Auto Shine team in Hartford, Connecticut. There are discounts for AAA members and active military. “We want to develop a relationship and get to know the customers,” Josh said. There are five employees on staff currently. Josh is hiring still for general laborers. The car wash is currently open 8 a.m. to 5:30 p.m.
Josh also runs the Topsham location of Auto Shine. For more information, visit www.autoshinemaine.com, call 207-572-1065, find them on Facebook or email autoshinemaine@gmail.com.